Charles Evans decided to focus exclusively on the baritone saxophone at the age of seventeen, after playing alto saxophone for five years. His very open-minded parents, Clarence and Genevieve, fully supported his new found passion for music and the granddaddy of saxophones. After attending the Pennsylvania Governor's School for the Arts in 1996, he set out to develop a personal saxophone sound and become a great baritone saxophonist. Charles received a Bachelor's degree in jazz performance from the University of the Arts in Philadelphia. During these years he studied with the likes of Bill Zaccagni, Chris Farr, John Swana, Julian Sparacino, Jim Buckley, and the great David Liebman. His experience with Liebman proved life-changing, instilling an artistic mindset in the young baritone saxophonist and inspiring him to pursue music to his fullest potential. While in Philadelphia, Charles payed his dues at local jam sessions and also began working around town in various configurations. It was at this time that he recorded on bassist Moppa Elliott's debut album, Pinpoint. He also formed a unique John Coltrane Tribute trio that performed throughout the Philadelphia area. In 2002 Charles decided to move to New York following Liebman's cue. He received a Master's degree from Queens College in 2004 after studying with well-known musicians Antonio Hart and Michael Mossman. He has recently received his New York State Teacher's Certification after working on a second Master's degree in Music Education. While in New York, he furthered his baritone saxophone expertise by studying with the likes of Ronnie Cuber, Gary Smulyan, and George Garzone. He has performed with David Liebman, Ravi Coltrane, Peter Evans, John Swana, Chris Farr, Tony Miceli, Tim Armacost, Billy Hart, Gene Jackson, Antonio Hart, Michael Mossman, James Zollar, Duane Eubanks, and Phil Markowitz. Charles resides in Queens New York, where he leads his own group, The Language Of. The music of the Language Of alternates between traditionally rooted micro-tonal contra-facts and free-jazz compositions. Lately he has explored 20th century harmony with two duos; one with guitarist Erik Dutko and another with the dynamite pianist Neil Shah. He also works around the New York area in various other settings, such as the baritone chair in the Brooklyn Big Band and an electro/acoustic duo, The Derividactory. Under the guise of 'The Modern Poet,' Charles also has entered the world of performance art through the use of his personal substitutionary language, acoustic and antagonistic political rhetoric, and live bodybuilding. As a leader Charles has released three CD's after being signed to Greatbend Records (www.greatbendrecords.com). One is a collection of Ballads, and two others are with his quartet the Language Of, featuring the remarkable trumpet player Peter Evans. The quartet has two CD's to its name, It Needs It, and No Relation. Charles is currently releasing an epic solo project entitled "The King of all Instruments," which is an all-baritone over-dub album of original music that explores 20th century classical chromatic harmony utilizing a very wide range of the horn. Ballads, It Needs It, and No Relation have received rave reviews from very prestigious sources, such as ejazznews.com, jazzreview.com, Cadence Magazine, and The Wire among others. 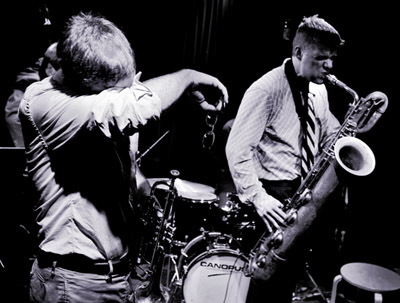 Critics have recognized the young baritonists' unique ability to sing beautiful melodies in the difficult altissimo register of the baritone saxophone, while also being capable of addressing the challenges of executing the demands of bebop and free-jazz musics on this cumbersome instrument. Showcasing a big sound and a light articulation, Charles has already proven to be a very versatile improviser; a delicate and sensitive melodist with an intense and passionate approach to free-jazz while simultaneously displaying virtuosic traditional bebop fluidity through rhythmic and harmonic variation. Charles believes that art is at its best when separated from the dictates of finance. He is committed to keeping his musical and artistic calling honest, through the expression of his many sides; whether it be a lush and haunting ballad, a micro-tonal bebop solo, or a bodybuilding/political/comical improvisation.